Dutch designer Piet Hein Eek has revealed the first products from his ongoing collaboration with IKEA – a collection of furniture and homewares based on traditional Indonesian and Vietnamese crafts. Titled Jassa, the IKEA range features natural fibres and batik-inspired prints throughout its seating, basketry, pendant lighting, ceramics and textiles. The limited-edition range will launch in March 2017 and is the first of several product lines promised from the partnership between the Dutch designer and the Swedish furniture giant. 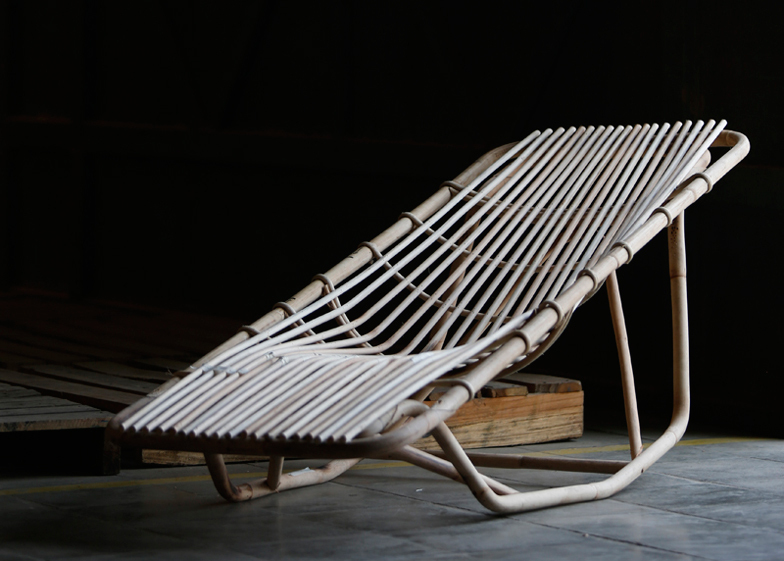 Incorporating woven rattan, seagrass and water hyacinth alongside bent bamboo, the items represent a fusion of handmade aesthetics and mass-production techniques. IKEA's design team spent time learning textile printing techniques in Indonesia and basket weaving in Vietnam, as well as traditional bamboo-bending. "Designing for IKEA is almost the opposite of what I normally do," Eek said. "Luckily, the rational approach in both processes, both for small and large quantities, are the same – one has to think about efficiency in every aspect." "All of a sudden it's possible to make products with the same mentality and attitude, for a bigger audience," said Eek. Recent projects from Eek have included cuboid ceramic lamps with a simple metal switch and a collection of wallpapers that resemble architectural materials such as marble, brick and wood for manufacturer NLXL. "It was Piet's focus on working efficiently with materials, production techniques and craft that made us realise the common ground we work on when designing products," said Karin Gustavsson, creative leader at IKEA. Eek is not employed by IKEA but has been asked to provide ideas for products across the company's range, which will result in a string of collections to be launched over the next few years. Last year, the Swedish furniture giant launched a collection by British designer Ilse Crawford that showcased natural fibres. The company most recently announced collaborations with Danish brand Hay and British designer Tom Dixon, one of the results of which was a reinterpretation of IKEA's iconic blue bag. IKEA's design manager Marcus Engman previously spoke to Dezeen about how the company is using design to overhaul its reputation for "doing cheap stuff". "I want to bring the surprise back to IKEA," he said. "We are putting a bigger emphasis on design."